The year 2018 is off to good start at Vigor. The Harbor Island facility welcomed a new drydock christened the Evolution. The $20 million Evolution is the third drydock at Vigor’s Seattle facility and largest in the Puget Sound region, measuring 640 x 115.5 ft. with a lift capacity of 22,000 LT.
Other investments in Seattle include a buildout of a dedicated aluminum production facility which greatly expands Vigor’s fabrication capabilities and capacity for workboats, ferries and high-performance military vessels. Investments at Vigor’s Portland, Oregon facility center around upgrading its comprehensive quality management systems in complex fabrication. Swan Island is now certified through AISC (American Institute of Steel Construction) to build bridges and received AS9100 certification for Aerospace through NQA. In addition, NQA1 certification at the facility is being finalized for Nuclear programs. Ongoing marine fabrication includes the Tazlina and Hubbard Alaska Class ferries at the Ketchikan, Alaska shipyard. Tazlina will be christened on August 11. The dayboats have a 300-passenger and 53 car capacity and measure 280 ft. in length. 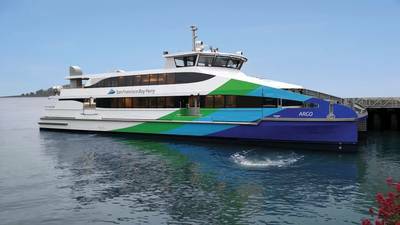 Seattle teams delivered its fourth 144-car passenger ferry, Suquamish, to Washington State Ferries in July. The ferry measures 362 x 83-ft. with a draft of 24.5-ft. Also in Seattle, fabrication of the fourth, 400-passenger Hydrus class ferry, Carina, is underway for WETA. The third, Argo, was delivered in May. Both vessels measure 135 x 38-ft. with a draft of 6.75 ft. They are powered by two MTU 12V4000 M64 diesel engines for a cruising speed of 27 knots. 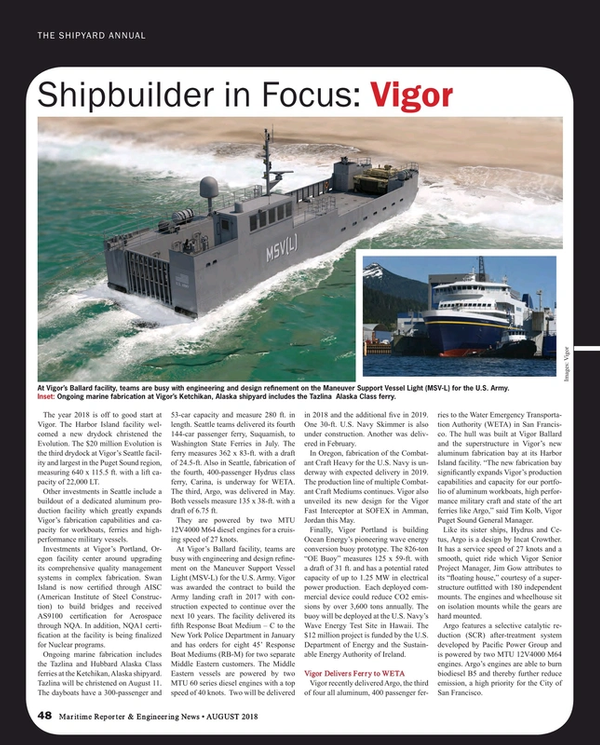 At Vigor’s Ballard facility, teams are busy with engineering and design refinement on the Maneuver Support Vessel Light (MSV-L) for the U.S. Army. Vigor was awarded the contract to build the Army landing craft in 2017 with construction expected to continue over the next ten years. The facility delivered its fifth Response Boat Medium – C to the New York Police Department in January and has orders for eight 45’ Response Boat Mediums (RB-M) for two separate Middle Eastern customers. The Middle Eastern vessels are powered by two MTU 60 series diesel engines with a top speed of 40 knots. Two will be delivered in 2018 and the additional five in 2019. One 30-ft. U.S. Navy Skimmer is also under construction. Another was delivered in February. In Oregon, fabrication of the Combatant Craft Heavy for the US Navy is underway with expected delivery in 2019. The production line of multiple Combatant Craft Mediums continues. Vigor also unveiled its new design for the Vigor Fast Interceptor at SOFEX in Amman, Jordan this May. Finally, Vigor Portland is building Ocean Energy’s pioneering wave energy conversion buoy prototype. The 826-ton “OE Buoy” measures 125 x 59-ft. with a draft of 31 ft. and has a potential rated capacity of up to 1.25 MW in electrical power production. Each deployed commercial device could reduce CO2 emissions by over 3,600 tons annually. The buoy will be deployed at the US Navy’s Wave Energy Test Site in Hawaii. The $12 million project is funded by the US Department of Energy and the Sustainable Energy Authority of Ireland. Image: VigorVigor recently delivered Argo, the third of four all aluminum, 400 passenger ferries to the Water Emergency Transportation Authority (WETA) in San Francisco. The hull was built at Vigor Ballard and the superstructure in Vigor’s new aluminum fabrication bay at its Harbor Island facility. “The new fabrication bay significantly expands Vigor’s production capabilities and capacity for our portfolio of aluminum workboats, high performance military craft and state of the art ferries like Argo,” said Tim Kolb, Vigor Puget Sound General Manager.Like its sister ships, Hydrus and Cetus, Argo is a design by Incat Crowther. It has a service speed of 27 knots and a smooth, quiet ride which Vigor Senior Project Manager, Jim Gow attributes to its “floating house,” courtesy of a superstructure outfitted with 180 independent mounts. The engines and wheelhouse sit on isolation mounts while the gears are hard mounted.